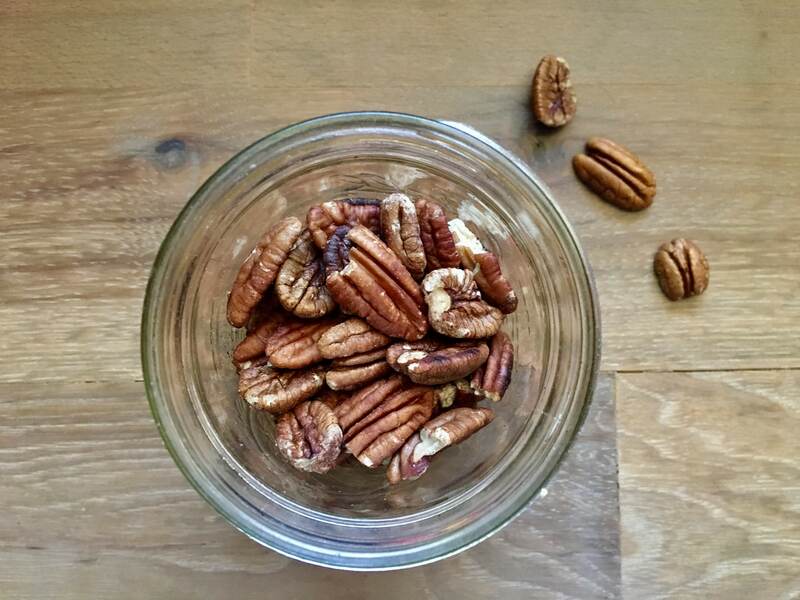 If you haven’t yet tasted freshly toasted nuts from your own kitchen, now is the time! Dr. Joel Fuhrman (whose health recommendations I follow) recommends all nuts be consumed raw or lightly toasted. Most nuts sold in the grocery store or market are covered in oil, then roasted at very high temperatures, then coated in salt and sugar. These taste good, but they’re no longer healthy additions to your meal. Instead, they become calorie bombs that make most people crave more nearly insatiably (at least I am in that camp). Raw and lightly-toasted nuts, on the other hand, are health-promoting, nourishing, and satisfying. You can buy raw nuts in the bulk section of most grocery stores, as well as in the baking or health food aisles. 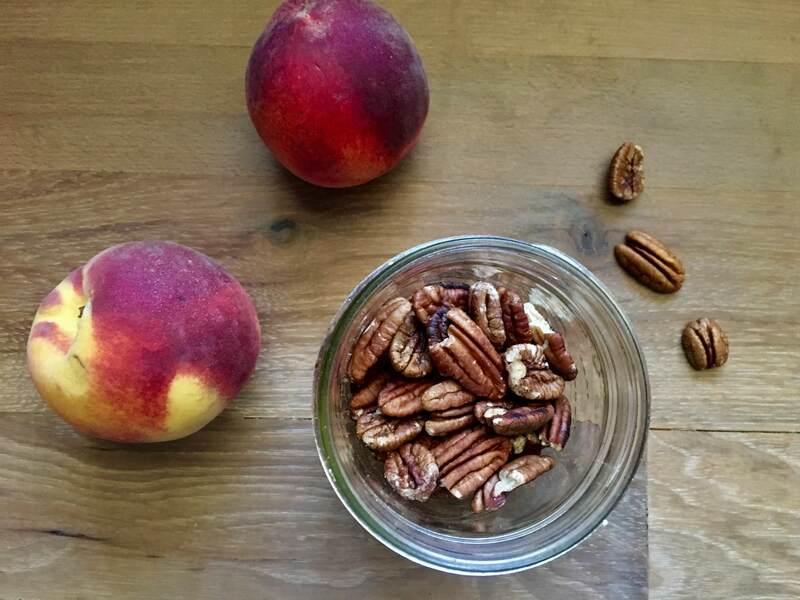 I usually lightly toast all of the nuts and seeds I eat and then store them in glass mason jars in the refrigerator. 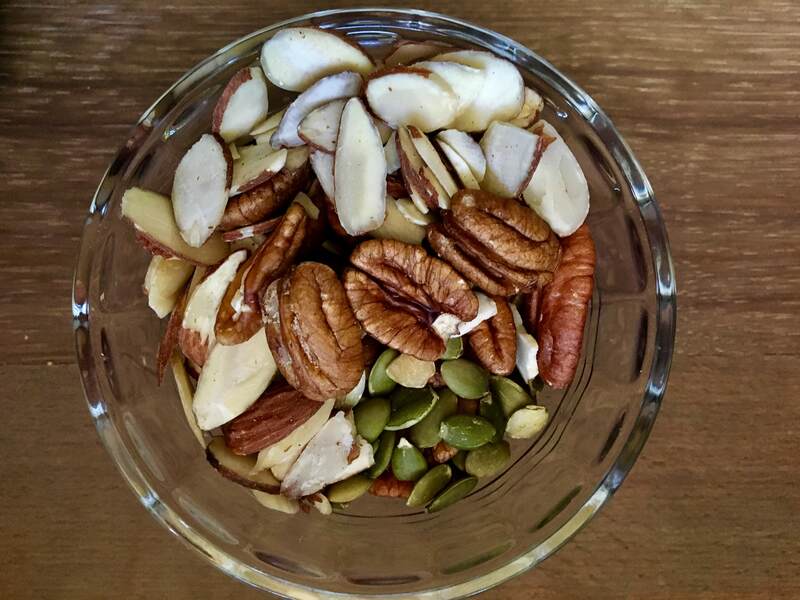 My favorite nuts and seeds these days are pumpkin seeds, sunflower seeds, pecans, walnuts, and cashews. I usually have some combination of these every day (as well as ground flax seed) mixed into salads, sprinkled on soups, or added to overnight-soaked steel cut oats. Keep ‘Em Toasty, But Not Burnt! For mindless tasks like toasting nuts in the kitchen, I really like listening to audiobooks. Most local libraries have audiobooks available for digital download. I also have a membership to Audible which I really enjoy. Listening to audiobooks is relatively new to me, but has been a welcome addition to drives and long walks. I mostly listen to audiobooks in the kitchen, though. I know many people love cooking for its meditative quality, but I became drawn to cooking and recipe creation through necessity. A whole-foods, plant-based way of eating involves a new level of creativity for me. Audiobooks help keep my mind occupied and entertained so I avoid running around while I’m toasting nuts and then burning them (and other such mishaps that have absolutely occurred). My recent favorite audiobook is called A Natural History of Dragons: A Memoir By Lady Trent by Marie Brennan. It is SO good! The narrator is so convincing, hilarious, and adorable–and those are the circumstances where an audiobook can take a written book to a whole other level. It’s a blend of Victorian historical fiction + Harry Potter + Downtown Abbey propriety and humor. If you haven’t yet created an Audible membership, you can get a 30-day free trial (as of this writing). Your first book is free and if you don’t want to keep the Audible membership ($14.95 per month for 1 “credit” for an audiobook), just cancel within the 30-days and you get to keep whichever book ordered for free. Check it out if you feel so inspired. Toasted nuts and seeds are an essential and delicious element in nearly all of the meals served at the Fit French Vegan household. Enjoy a variety of these in your meals! 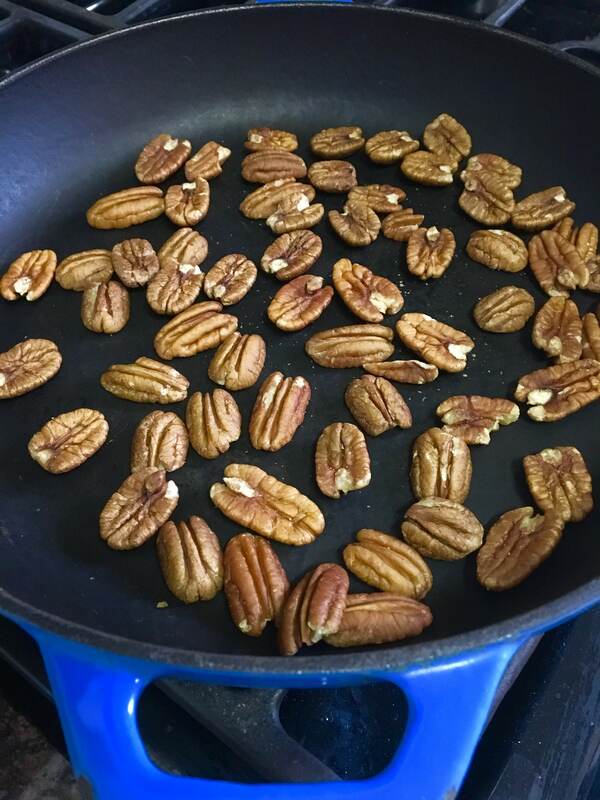 Nuts can be toasted in bulk and are best toasted separately (i.e., first almonds, then pecans). Warm a pan over the stovetop to medium heat. Spread 1/2-1 cup of raw nuts or seeds so they are in one layer on the surface of the pan. Stir with a spatula and shake the pan every 30 seconds or so to avoid burning. 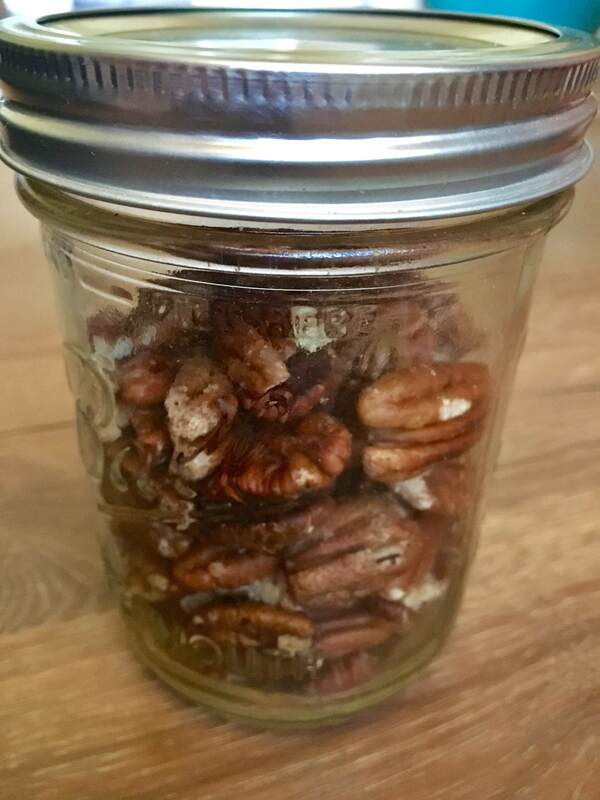 Once you see a light browning, turn off the heat and transfer the nuts/seeds to a mason jar or container. 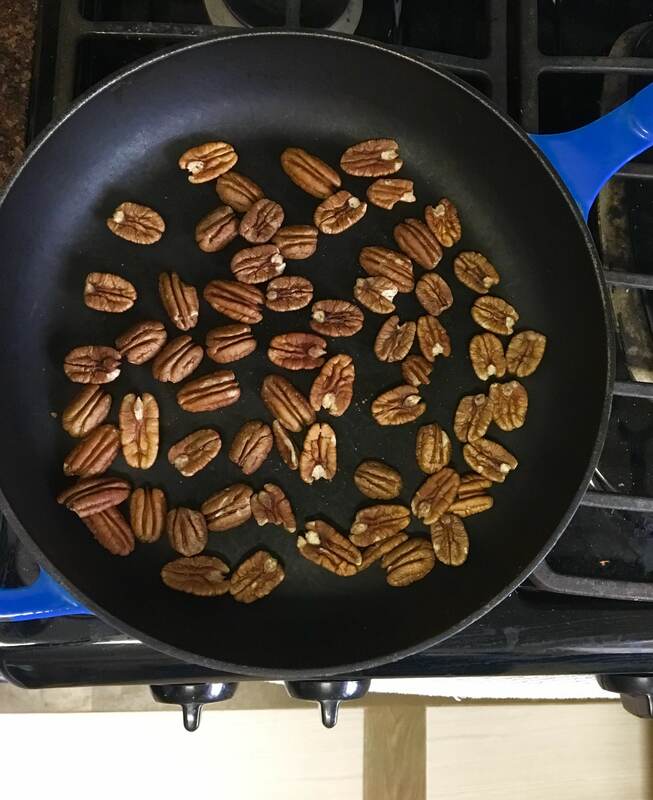 Leave the lid off while the nuts cool. Once cooled, add lid and store in fridge. Keep a close eye and try to resist multi-tasking. Different nuts and seeds toast at different rates. Will keep in the fridge for 2-3 weeks.